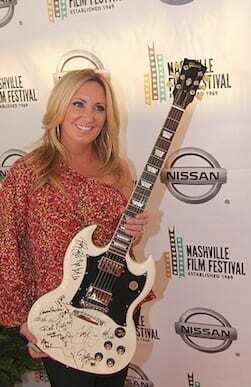 Lee Ann Womack yesterday (4/25) at NaFF. I usually try to make a point of supporting the Nashville Film Festival by attending some of its many movies with music themes. On Wednesday evening (4/25) that meant a trip to Green Hills for the sold-out screening of Hank Cochran: Livin’ for a Song. The documentary tells the life story of one of the most endearing, gifted, fascinating, charismatic, charming and quirky characters who ever called Nashville home. Hank Cochran died in 2010. The filmmakers immortalized his remarkable saga during the five years leading up to then. The film’s content is thoroughly compelling, for Cochran was one of the great raconteurs. His life story is fascinating as a fourth-grade-educated Mississippi child who rose to become a member of the Nashville Songwriters Hall of Fame (and who should be a member of the Country Music Hall of Fame). His classic songs are undeniable – “Make the World Go Away,” “She’s Got You,” “I Fall to Pieces,” “Set ‘Em Up Joe,” “The Chair,” “Don’t Touch Me,” “It’s Not Love But It’s Not Bad,” “Why Can’t He Be You,” “Don’t You Ever Get Tired of Hurting Me,” “Ocean Front Property,” “A-11,” “That’s All That Matters to Me,” “A Little Bitty Tear,” “This Ain’t My First Rodeo,” “Who You Gonna Blame it on This Time,” “You Comb Her Hair,” “Funny Way of Laughing,” “Is It Raining at Your House” etc. etc. Whenever someone performs one of these in the movie, time stands still. Elvis Costello, Ronnie Milsap, Lee Ann Womack, Jamey Johnson, Mandy Barnett, Beegie Adair, Mike Henderson, Mark Chesnutt and others create magic whenever they’re on screen in song. 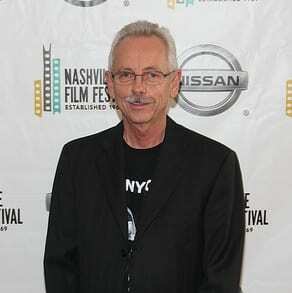 Buddy Cannon yesterday (4/25) at the NaFF. So, yes, the content is terrific. The film’s finesse, not so much. 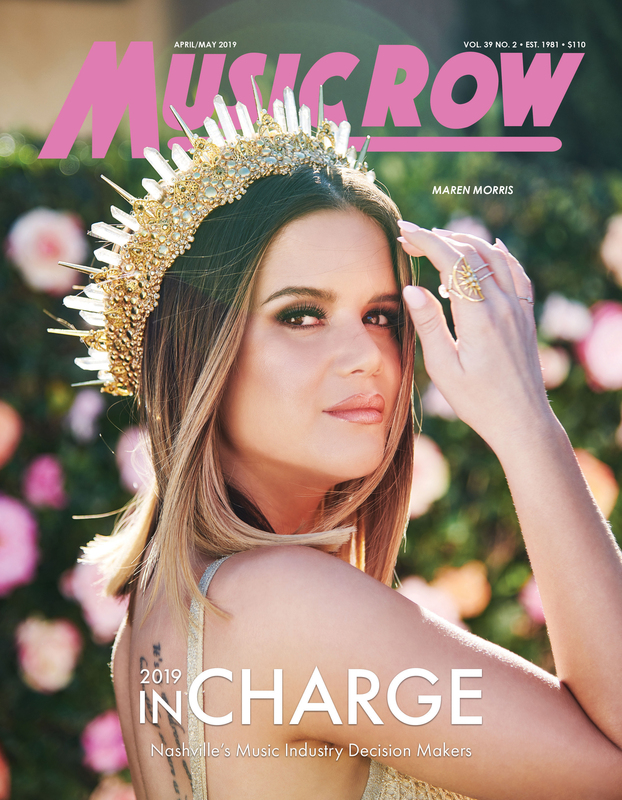 The Nashville Scene charitably described it as “a straight-forward, no-cinematic-frills documentary.” What that means is that absolutely no attention seems to have been paid to photographic composition, lighting, film technique or visual quality. It’s as if the subjects were simply sat down just anywhere and the camera turned on. At times, the visual results are downright ugly. Also, my heart went out to whoever had to deal with the wildly varying sound quality during editing and post-production. But for the sheer enjoyment of seeing and hearing “Hanktum” again, we were willing to put up with oafish production values. Packing the Regal Cinema 16 were John Prine, John D. Loudermilk, Dean Dillon, Dale Dodson, Luke Lewis, Martha Moore, Troy Tomlinson, Mandy Barnett, Buddy Cannon, Jay Orr, Suzanne Kessler, Cathy Gurley, Brett Woolcott, Suzi Cochran, Holly Gleason, Vernell Hackett and Belmont’s Don Cusic and James Elliott, among many others. 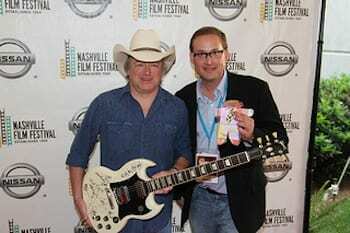 Mark Chestnutt and NaFF Executive Director Ted Crockett. Other music-oriented films at the festival centered on Paul Williams, Charlie Louvin, Rick Springfield, Dolly Parton, Paul Simon, Bobby Bare Jr., Wes Cunningham, Andrew Bird, Common and Hole rock drummer Patty Schemel. Under African Skies, the doc about Simon’s Graceland album, won the Music Films Grand Jury Prize. Parton was given the Career Achievement Award. Williams was presented with the Mike Curb Award for Film Music. Nashville theater entrepreneur, director, actor, playwright and filmmaker jeff obafemi carr won a special award for He Ain’t Heavy, his controversial film about fraternity hazing. The hostess with the mostest at Tuesday’s (4/24) Dining Out for Life AIDS charity event at numerous Nashville restaurants, was Kay West, presiding at the French-themed bistro Table 3. She attracted such fabulons as Kristi Rose, Jill Forbert, Robert Ellis Orrall, Tamara Saviano, Wendy Stamberger, Liz Thiels, Elaine Wood, Paula Batson and Denise Stiff, not to mention a big politico table including Rich Riebling, Christine LaLonde, Dan Kornfeld, Hedy Weinberg and I-hope-our-future-mayor Megan Barry. Miss Mary dined on the succulent veggies in puff pastry. I had the beef bourguignon, which was delish.